I tried my first Liège-style waffle on a childhood vacation to Quebec. That crispy sugar, that sweet and malty dough – my family talked about it for years, and tried to recreate it at home with mixed results. The trick is using the correct sugar. Pearl sugar has pea-sized pieces of sugar, hard but not so hard you break your teeth. 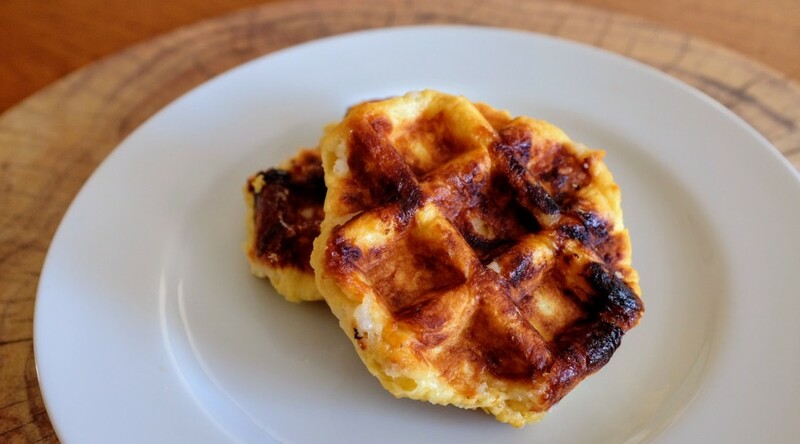 They melt and caramelize in the recipe, creating sugary pockets throughout the waffle. I usually buy Lars Own Pearl Sugar since it’s widely available and works well. I’ve tried several recipes but my favorite is the recipe on the back of the package with slight adaptations. My waffle iron of choice is an early 80s hand-me-down from my parents, a “Belgian Waffler by Munsey.” There’s nothing special about this model that makes it perfect for Liege waffles, though maybe its lack of temperature control allows for better caramelization. In any case, I don’t mind mucking it up as I would a fancier waffle iron, and you can get one for around $20 on eBay. Heat the milk in the microwave for about 45 seconds until it is lukewarm (around 110 degrees – don’t overheat it). Dissolve the yeast in the milk, and let sit for 5 minutes until it gets frothy. Put the flour in the bowl of a stand mixer with the paddle attachment. You can also mix this dough by hand, but it gets sticky. Slowly mixing, add the milk/yeast, then butter, then eggs. Cover the mixer bowl with a tea towel or paper towel, and let the dough rise for 30 minutes to an hour, until doubled in size. Mix in the pearl sugar – you can use the mixer, but it’s also easy to do by hand because the dough won’t be as sticky. Form around 20 to 24 small balls of dough (they can be rough) and put them on a baking sheet to rest. I usually let them rise for another half hour, but you can skip this if you’re in a hurry. Cook the dough in a Belgian (large-holed) waffle maker for about four minutes, depending on your iron. 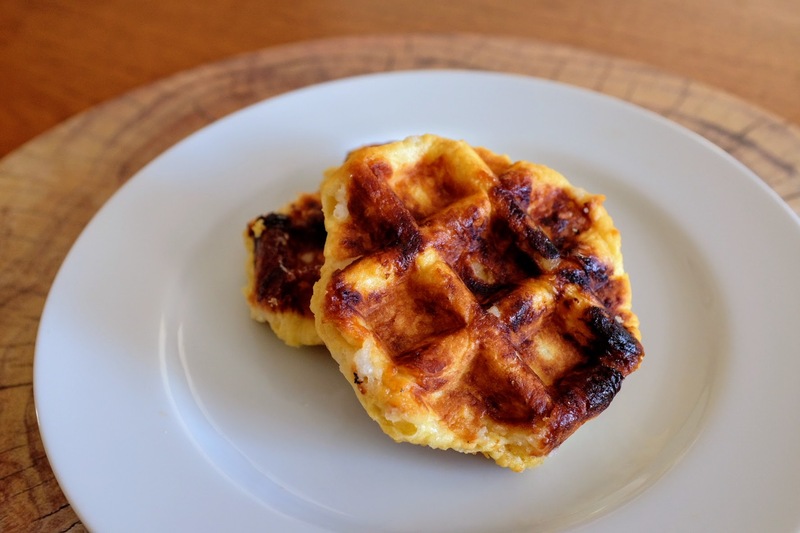 The waffles will be crispy and lightly browned, with the sugar slightly caramelized. We made the excellent decision of ordering five pounds of bulk cocoa nibs from Urban Greens. I’m going to a friend’s birthday cookout today, and since he’s a creative cook, I thought some cocoa nib cookies were in order. Too bad the recipes I found were a bit boring. Most mixed cocoa nibs with chocolate chips, which is like putting a precious stone in a piece of costume jewelry. Some were ultra healthy paleo “cookies”. 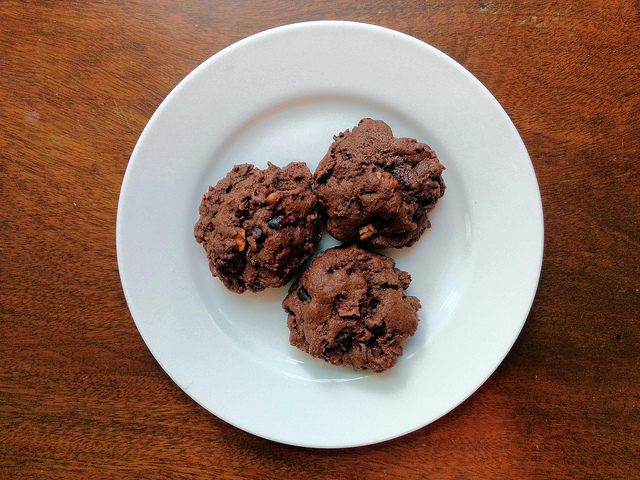 I wanted something decadent and creative, so I adapted a basic double-chocolate cookie recipe with thousands of positive reviews into this more unusual combination. Summary: Double chocolate spiced cookies with cocoa nibs and pecans. Makes about 20 cookies. Combine the flour, cocoa, baking soda, salt, and spices (cinnamon, nutmeg, and cayenne) in a bowl and whisk to combine. In a stand mixer, beat the softened butter, sugar, egg, and vanilla until fluffy. While mixing on low, slowly add the flour mixture until just combined (do not overmix). Stir in the cocoa nibs and pecans until evenly mixed. Drop onto the cookie sheet in mounds the size of a ping-pong ball. No need to make smooth balls. Bake for 10 minutes or until the cookie is baked on the outside but still soft. Transfer to a wire rack to cool. What dessert could possibly fit with tonight’s chicken tomatillo enchiladas and use the rest of our Narragansett Creamery ricotta? My mind immediately jumped to “Mexican Cannolis”, and rather than search for a recipe, I decided to improvise. The result was so delicious, I had to document it here! Please let me know if you try it. I used a disk of Abuelita Mexican drinking chocolate for this recipe. 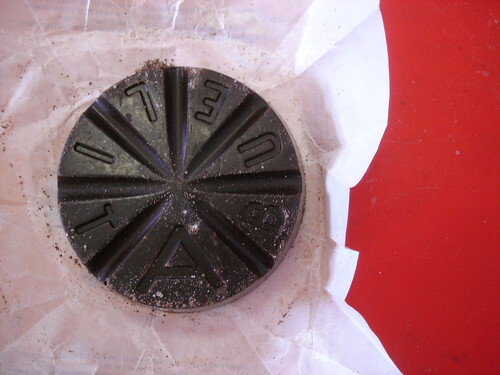 These disks contain sugar, so they sweeten the filling nicely. I happen to have a lot of Abuelita on hand, but if I didn’t, I’d might have opted for the Chocolate Mexicano discs made by Taza in Somerville, MA. Preheat oven to 350. Place corn tortillas on a cookie sheet and spray with cooking spray or lightly brush with oil. Mix cinnamon with sugar and sprinkle on the tortillas. Chop the chocolate into pieces smaller than petite peas. Usually, since the chocolate is sugary, you’ll get a lot of chocolate ‘sand’ when you’re chopping – that’s great. Mix the chocolate into the ricotta until very well combined. Whip the cream and fold into the ricotta mixture. Bake the tortillas for 10-15 minutes. Remove from the oven and allow to cool for a minute or two. Top each with half the ricotta mixture and gently shape into a taco or cannoli shell. (Ours were a good consistency – soft enough to bite, crunchy enough to conjure a cannoli). Fudge is often thought of as a rare vacation treat, sampled and occasionally purchased at gift shops (“shoppes”?) or on the boardwalk. But it’s actually very easy to make – especially with this shortcut recipe. If you’re looking for a last-minute treat to make for your valentine this year, this is it. This recipe skips the messy and difficult techniques – all you have to do is melt, stir and pour. Still, every time I’ve made this fudge, it’s gotten rave reviews. Enjoy! 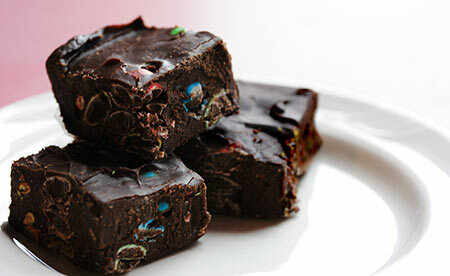 * I love dark chocolate, so for the M&M fudge, I mostly used Baker’s Semi-Sweet chocolate and added a few ounces of a Ghirardelli 100% unsweetened baking bar. Spray a 9×9 pan (or 9×13, for thinner fudge) with non-stick spray, or line with wax paper. If you’re using chocolate bars, chop them into small pieces. 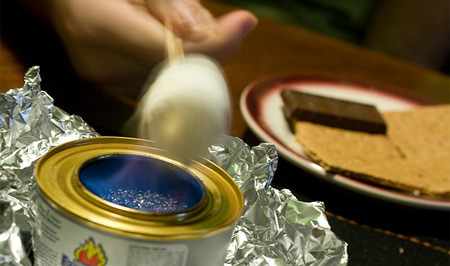 Pour the can of condensed milk into a pot. Turn off the heat. Stir in the vanilla and then the mix-ins. Pour into the prepared pan and smooth the surface. Allow to cool in the refrigerator until firm. Cut into squares. I usually find it easiest to remove the whole slab from the pan before cutting. Variations and ideas: Stir in 1/2 cup peanut butter. Use peanut butter, butterscotch or white chocolate chips. Make two different batches of fudge and layer. Some recipes call for 2-4 tbsp of butter, which is melted with the condensed milk and chocolate. We spend the first half of December anticipating the holidays, and all of a sudden we’re sucked into the frantic current of gift-buying and cookie baking. One way to battle the last-minute rush is to make your edible holiday gifts ahead of time. 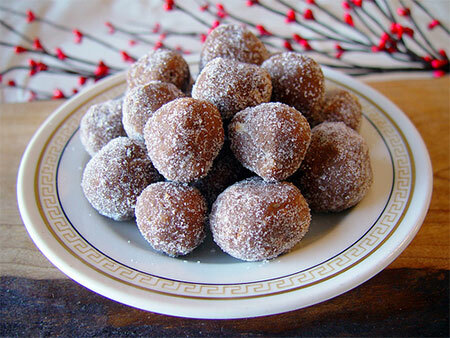 I love to make rum balls, which actually improve in flavor and texture after aging a week or two in a tin. I’ve also found that fudge keeps for quite a while in the fridge. Many cookies, such as chocolate chip, freeze and defrost well – just make sure to cool before freezing.